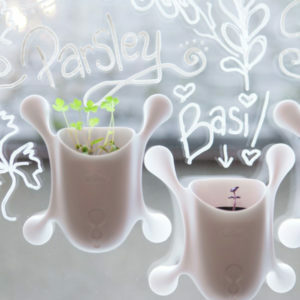 This seed collection is a triple threat! First, these awesome flowers are meant to grow in containers, so you don’t need a large space to have a beautiful garden. Second, these gorgeous blooms attract beneficial insects that help pollinate your garden while adding life and interest to your outdoor space. Third, these seeds are all All-America Selections winners and that means they are proven performers on so many levels! 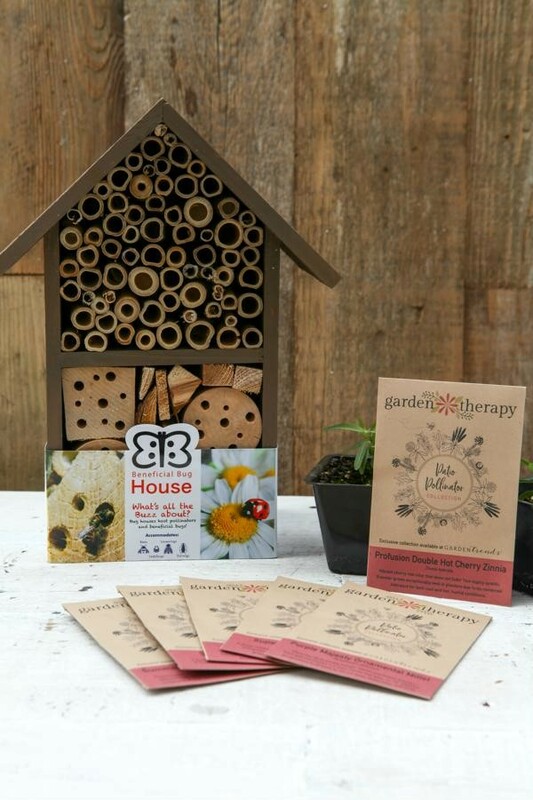 Not only that, but we’ve also included a beneficial bug house so your garden is fit for a queen (bee). 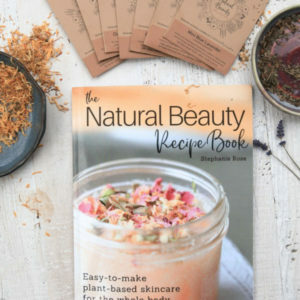 You’ll add decoration and function all in one with this collection that is good for the earth and great for you. 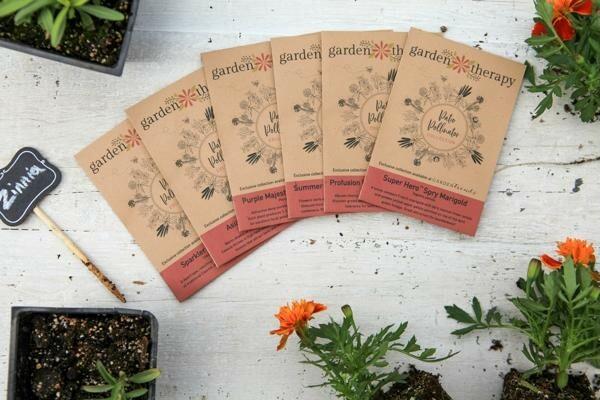 The seed collection includes 6 annual flower varieties: Summer Jewel™ Lavender Salvia, Sparkler Blush Cleome, Asian Garden Celosia, Super Hero™ Spry Marigold, Purple Majesty Ornamental Millet, and Profusion Double Hot Cherry Zinnia that have been proven to attract pollinators, so you can create an instant, pollinator -friendly garden. All of the varieties are proven to perform well in containers which means you don’t need a huge space to create a gorgeous garden that attracts beneficial pollinators. 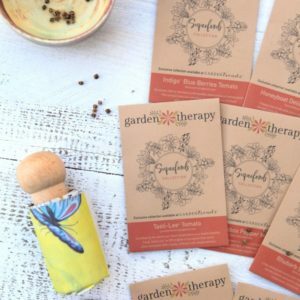 The patio pollinator seed varieties can be planted in a garden bed or container so it will fit in the space that works best for you. Each of the flowers were especially chosen to attract a variety of pollinators, including bees, butterflies, hummingbirds, birds, and moths, all of which are both important to help pollinate your other garden plants, especially vegetable gardens and fruit trees, but it’s also helpful to neighbors, public spaces, and our environment in general. 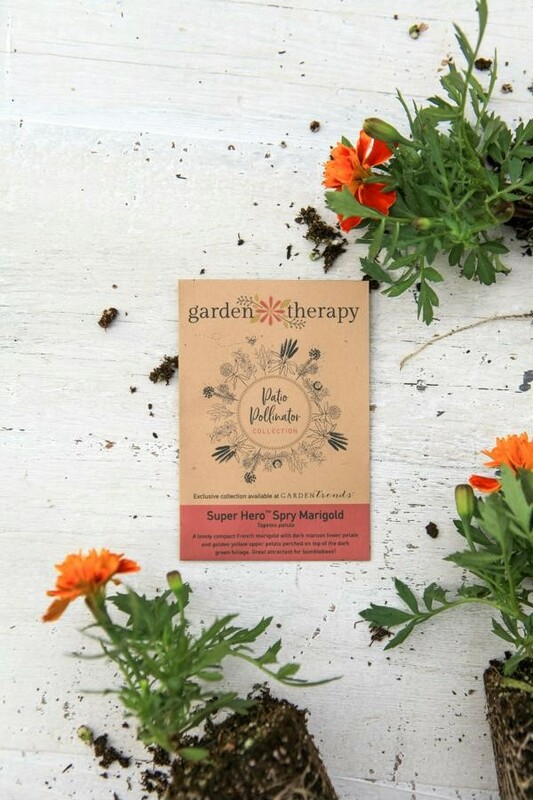 The whole collection is made up of All-America Selections Winners, which means they have been Tested Nationally & proven Locally™” for garden superiority by horticulture professionals across North America. You will have no doubt that these are the gold standard of seeds for the home garden and they will perform exceptionally for you as well. 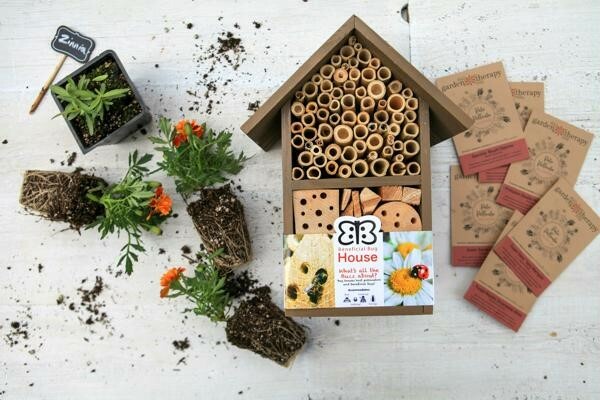 In addition to the seeds, this kit includes a stylish beneficial insect house that gives good bugs a place to live. Creating a space for beneficial to nest and breed, means they are more likely create a patrol in your garden, pollinating while also controlling pest populations. 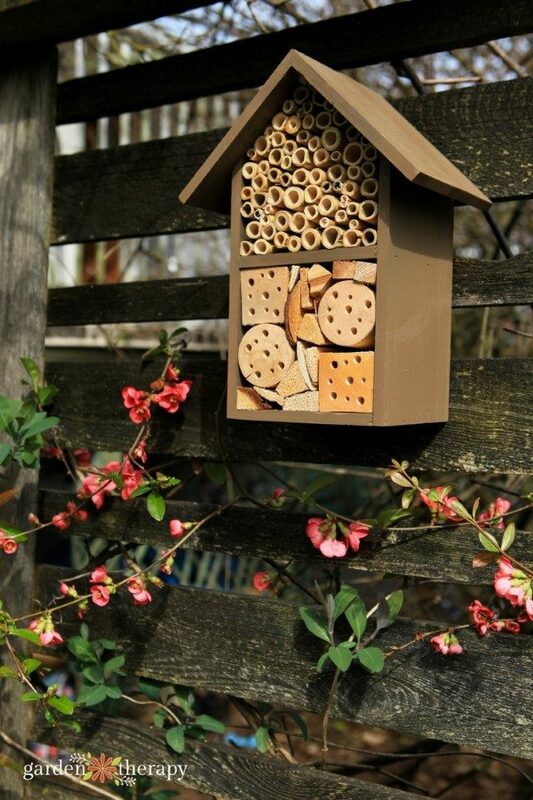 The top section of this insect house is for solitary bees to pollinate your garden. The bottom section is for lacewings and ladybugs, all of which will act as beneficial protectors by preying on garden pest insects. The bug hotel design provides weather protection and is built to last outdoors through inclement weather, so you won’t have to worry about replacing it for a long time. And it looks pretty great hanging on your fence or wall too. It’s functional garden art! 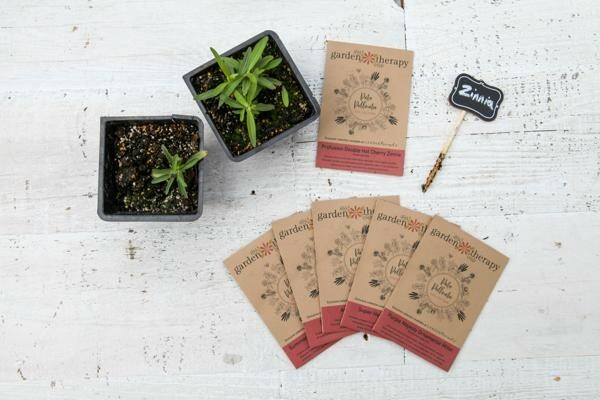 And each of the Garden Therapy Seed collection Kit comes with a detailed seed-starting and culture guide that shows you how to start the seeds indoors or outside as well as specifics on each seed variety like how many weeks in advance of the Last Frost Date to start them, soil temperature, and days to germination so you don’t have to guess how to grow them. The information is all there at your fingertips. For more details about the kit, see this blog post.